Install Nox App player offline installer emulator and run Android APKs on your own PC windows desktop OS. This emulator is free to download and best alternative to blue stacks, Andy emulator, you wave and PS3 emulator bios file as we proudly discussed them is previous posts. At the very end, you will the download link for MAC and PC windows XP, 7, 8, 8.1, 10 and Vista respectively. the operating systems whatever 32 bit or 64 bit it will support for both on the go. It is the latest version which recently released and you will found on the market. We will make it simple and you get it within some easy steps. Also, I will give instructions how to download, install and use the NOX app player on your personal device. Now it comes with many features as it is a market and checked as the world's # 1 Android emulator so you can solve various problems which are facing while you wants to open APK files on windows desktop os windows or MAC OS as well. Just have a look on its all features. Running for Android KitKat kernel version which is 4.4.2. Very simple interface to get android applications on windows. Integrated with google play store. You can download this program without losing any single cent. The both provided download link are offline installers. Once download it and install without any internet connection. The complete tutorial about how to download and install this app on your device is just right here placed. Follow these instructions to get full access to this app without any problem. 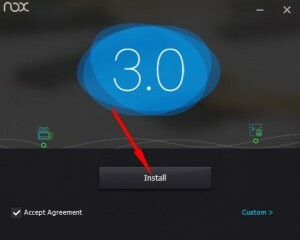 Before installing you will need an installer of Nox app. First of all, you have to download the app from the given link which is placed at the bottom. Now found the setup EXE going to download option on your browser. Now double-click on it to start the process. As shown in above picture click to start. Wait for a while to finalize the process once and you will be able to install the app without restrictions on your currently using device model. 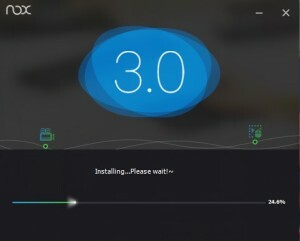 Click on the big button which shows Install. Just mark the box at the left bottom as you can see in the above box. Marking of this box means that you are accepting the terms and conditions which are applicable from the developers of this app. Again wait for sometimes it will automatically do the whole wizard. Once finish this wizard it will auto close and make a desktop shortcut on your main screen. Where you can found the app which is labeled as Nox App player offline installer. To launch it double-click on it or click on the right mouse and at the top select the open option and it will run the app for you. Now you are on the go to RUN android apps on windows anytime, anywhere and anyhow. I hope you will do all the procedure successfully and ready to use the app instantly. To get all of its features perfectly on your PC/Laptop must have these things in it. As per your request Nox App Player offline installer Emulator download for Windows PC, Mac, Laptop is here and in a very highly compressed format with offline installer setup.